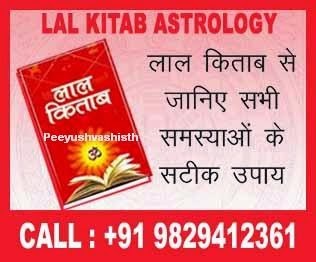 Lal Kitab, termed as “The Wonder Book” of Astrology, was originally published in Urdu language, enshrines such effective astrological principles and remedial measures that it has rightly been. Lal Kitab has announced unique remedial measures to solve chronic and critical human problems in day to day life. These measures do not require the practice of ordeals, Yagnas, Havans and other complicated and expensive rituals, which prove more troublesome for persons who are already in trouble because of the evil effects of certain planets. Rashis are not considered or taken into account for predictive astrology.The ascendant is treated as the first house and it is regarded as the house of the first Rashi, i.e., Aries and counting progressively in a sequence up to the 12th house being that of Pisces. For hyperactive and in-disciplined children: In order to stop children being unpredictable, the child should offer one oiled chappati every Saturday to a dog. For Removing evil spells: If a person believes that an evil spell has been cast on him, he should offer burfis ( milk sweets) on Sunday and Monday to a cow. On Tuesday and Wednesday, Friday and Saturday he should give motichoor ladoos ( a ball like orange sweet) to a dog. For Studies in Children: Students who want to improve in their studies should offer jaggery and roasted grams to monkeys, Hanuman temples and feed the birds. To attain success in Job Interviews: While going for a job interview take a chappati and throw it in the direction of the crows. For Professional Success: Soak black grams on Friday night and then mix with mustard oil. Give half to a horse or buffalo and half to a leper. Do this for forty days to ensure professional success. If your business is sluggish: Make some besan laddoos, wave them round your head seven times and feed them to a cow on Thursday. If you want a promotion: Offer the birds seven types of cereals. For your income to rise give wet black grams to monkeys. To get married: You should give two balls of wheat flour mixed with a little turmeric, jaggery and wet gram pulses to a cow every Thursday. To cure a wayward Husband: If your husband , under the influence of another woman, ignores or criticizes you , take 300 grams of ladoos made of gram flour(besan) two ladoos made of wheat flour, three bananas and wet gram pulse and feed these to a cow that is feeding its calf. Your husband will change. For Family Peace and Serenity: Once a month cook more sweet chappatis than the number of people and guests you have in the house and give them to any animal. This will save the family from quarrels and expense. Respect your father. This will strengthen your Sun who ascertains success, high post, help from Government etc. Respect Elderly People, Saint, Priest for strengthening Jupiter in your chart. Jupiter is a planet that bestows Gyana, Dhana, Bhagya, Gurutva etc. Avoid kicking dogs or beating them. Better feed them. This will improve the effect of dragon’s tail (Ketu) . It is symbolic of son and of luxurious life. Use silver tumbler and utensils. This brings good effect of moon and remove the bad effects of dragon’s head (Rahu). Make arrangement for keeping dining table close to the kitchen. Avoid eating while seated on your bed. This reduces ill effect of Rahu. Dispose of articles which have not been used for decades, do not clutter your house /office with unnecessary articles. This Upay also reduces bad effect of Rahu.The above two steps will reduce the bad effect of dragon head (Rahu) who is natural malefic and whose job is to cause unnecessary and avoidable worries and fears. Feed cows. This improves conjugal life and health of wife. Feed crows/fish. This brings affluence and enhances mother’s health. Feed monkeys to improve financial condition and getting favors from the government.